If it is rumoured that former president Chandrika Kumaratunga was instrumental in getting Maithripal Sirisena to take on Mahinda Rajapaksa, the lady’s thinly disguised treatment of the candidate as though he was a serf in her ancestral estate almost turns it into fact. If that were the case then Maithripala should be grateful. For now. After all, he’s earned more brand-points over the last few weeks than he has accumulated over the last 40 plus years in active politics in the SLFP. If he loses, then he can’t exactly say ‘thank you, madam.’ He might think to himself, ‘I should have said, “thank you madam, but no”.’ But that’s all conjecture. For now. Right now, in a parallel universe, Maithripala goes to see Chandrika (yes, not the other way about) to discuss the status of the campaign. Here’s the transcript of the animated discussion. He sat. Waited. Respectfully. Chandrika was bubbling with enthusiasm. “There’s still a long way to go Madam,’ Maithripala was seasoned enough to know that it’s not over until it is over and wondered why his former boss was acting like a first time candidate for a Pradeshiya Sabha. Maithripala remembering that in the press conference held to announce his presidential bid he had paid a glowing tribute to Mahinda Rajapaksa for his leadership in ridding the country of terrorism, looked at Chandrika without betraying incredulity but still showing a bit of skepticism. It took a fraction of a moment, too quick for Chandrika to notice. She went on. And on. And on. 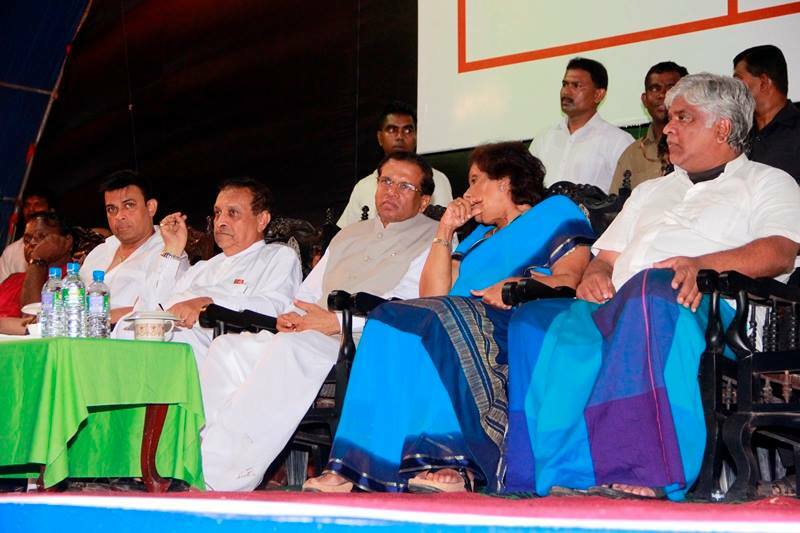 ‘Pooneryn, Mullaitivu?’ Maithripala couldn’t hide the incredulity now. ‘In other words conceding the 75% and offering three times as much?’ Maithripala was sounding a bit Presidential all of a sudden. Maithripala didn’t reply. He thought to himself. ‘Of course Madam. You will get your නිසි තැන (suitable position).’ Maithripala said. Straight face. Chandrika swallowed it. Maithripala bowed with perfect deference. Left.